Best tacos in New Smyrna Beach, but also there are other delicious options. They don't have full bar but their options of beer, wine and home made margaritas are excellent. ..
Pros: Lunch special from $7, but they also have a la carte, so you can eat only what you want for less. In taco Tuesday there's no minimum like others. Good ..
Cons: Parking is limited. They don't serve hard liquor. Dance Factory of New Smyrna Beach, Inc.
New Smyrna Beach, Florida has the Atlantic Ocean to its east, the Intra Coastal Waterway to its west, and the Mosquito Lagoon in between the two. With the nickname of "Florida's Secret Pearl" and a motto of "cygnus inter anates" which means "a swan among ducks", you can expect to find a unique city. New Smyrna Beach prides itself on being a laid-back small island town with southern charm even though it is close to such major attractions as Daytona Beach, Kennedy Space Center, and Disney World. It has the distinction of being the largest attempt by colonization in the New World by a member of the British Crown. Scottish physician Dr. Andrew Turnbull established "New Smyrna" in 1768 by bringing 1500 settlers to the area. However, disease, Native American raids and mistreatment by Turnbull caused it to be abandoned until 1887 when the Town of New Smyrna was incorporated with only 150 residents. In 1892 Henry Flagler's Florida East Coast Railway helped the area's economy. 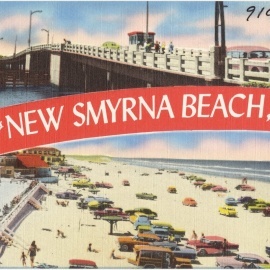 It became New Smyrna Beach in 1947 and now attracts over 1,000,000 visitors a year. New Smyrna Beach has been voted Florida's Best Beach and is also known for water sports, fishing tournaments. a historic downtown, museums, performing arts centers, parks, festivals, concerts, etc. The Inaugural New Smyrna Beach Wine and Food Festival was held April, 2018 as a huge success. Our goal is to grow this annual event each year gaining national recognition for being “first in class” with wines, food, and fun. New Smyrna Beach is a coastal community known for culture, art, dining and surfing. The New Smyrna Beach Wine and Food Festival intends to showcase over 250 wines with food pairings from acclaimed local chefs. Dueling Pianos is BACK at Peanuts on Friday, April 26th! Get ready for the best kind of battle with us and watch the show with our handcrafted burgers, washed down with your favorite cold brew.